What’s the History of Life Insurance? Back in the 1800s, someone said, “There’s a sucker born every minute.” Who said it? Was it P.T. Barnum, founder of the Barnum and Bailey Circus? A lot of people think so, but nobody knows for sure. But the way some people talk, you’d think whoever said “There’s a sucker born every minute” almost 200 years ago was the same guy who came up with the idea of life insurance. Winston Churchill said, “Never engage in a battle of wits with an unarmed man.” So we’ll ignore those defenseless and witless generalities and tell you the facts. Life insurance is a product that was born out of necessity—long before P.T. Barnum existed. In fact, long before the word “scam” existed. Even long before the English language existed! Life insurance existed back in Roman times—at least a full century BC. If you’ve ever seen people on street corners at a busy intersection, holding up signs asking for money to help bury a recently-deceased loved one, you know exactly the problem the ancient Romans faced. Funerals were expensive then, just as they are now. And, like then, they’re often unexpected. And when they are expected, they often come after a long illness with medical expenses that have drained a family’s resources. Someone in ancient Rome figured out (using Roman numerals, no doubt), that if everyone in a group put a few coppers in the kitty every week, there would be enough cash to cover the cost of a casket when needed. It wasn’t too long before someone else realized that if everyone would cough up just a little extra each week, there would be something for the widows and children, as well. And thus, life insurance was born—more than 2,000 years ago. An ancient Roman sets up the first “Casket Kitty,” so friends can chip in every week to provide for proper burials of whoever died next. Somebody suggests raising the ante, to help provide for the surviving wife and kiddies, too. Richard Martin buys the first recocded insurance policy: a one-year term policy on the life of William Gybbons. Martin Pays 30 pounds sterling, and receives 400 pounds sterling when Gybbons dies within the year. John Graunt is born, and later calculates average lifespans from Church records. From these records, John creates the world’s first mortality tables. Edward Lloyd’s Coffee House on London’s Tower Street becomes the go-to place for shipping news. The modern concept of an insurance company is born here and later becomes Lloyd’s of London. The Widows and Orphans Friendly Society becomes the first US company to make life insurance available to the working class. Later the company becomes Prudential. By now, 72% of adults in the US and more than 90% of all US husband and wife families own life insurance. About $1.2 billion are paid out in life insurance claims following the terrorist attacks in DC, New York, and Pennsylvania. You are reading this timeline and concluding that life insurance has been around a lot longer than you might have guessed. The question people asked then was the same question folks ask today. “Just how much do we need to pay? Copper doesn’t grow on trees, you know.” People squabbled over that, and the concept of life insurance actually disappeared for a few hundred years. The first recorded life insurance policy—more of a wager than a policy, actually—dates back to June 18, 1583. Place: London, England. Insured: William Gybbons, a salter (he preserved meat and fish). Policy owner: Richard Martin, a citizen and alderman of London. Insurance company (if you can call it that): Thirteen merchants of London. The arrangement was that for a one-time “premium” of 30 pounds sterling, Martin was given a written promise (the “policy”) that if Gybbons died within one year (this was apparently a one-year term policy) Martin would receive a death benefit of 400 pounds. Nice. Martin sued. “Balderdash!” he exclaimed, or whatever aldermen said back then when they were ticked. “A year is a year. How often do you celebrate your birthday? That’s what a year is.” He didn’t say that last part, actually, but he could have. In the end, the court agreed with Martin. The 13 merchants had to pay. There’s no record of how just how Gybbons died. Hmm. In any case, the story is probably accurate. It was written up more than 100 years ago in The Annals of the American Academy of Political and Social Science, Vol. 26, Insurance (September 1905). In the 1600s, another guy in Merry Olde England finally figured out how big the kitty should be—how much you’d need to charge for a life insurance policy so you wouldn’t go broke. How did he figure it out? We’ll tell you. 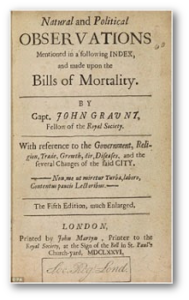 The very first actuary was John Graunt, born in London in 1620. In real life, John was a haberdasher. That is, he made his money selling buttons and bows. But he made his mark by reviewing church records (which had been dutifully recording births and deaths over the years) and figuring out average lifespans based on those records. Historians tell us John constructed the world’s first mortality tables. Graunt died in 1674, just before his 54th birthday. Historians do not tell us if John Graunt had bothered to take out a life insurance policy before his death. We’re sure that Mrs. Graunt and all the little Graunts wished he had. 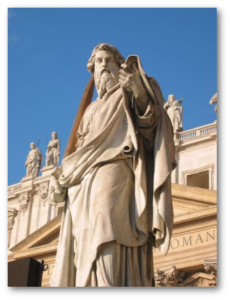 There are more elaborate types of life insurance policies, but they are all based on the concept created in Ancient Rome by those Ancient Romans and their numerals. Today, all life insurance policies have one thing in common: If the insured person dies while the policy is in force, the insurer will give the beneficiary a sum of money, called the death benefit. But the true stories of those who have benefited because someone had the foresight to take out a life insurance policy can teach us far more about the vital role life insurance plays, than even its history can. 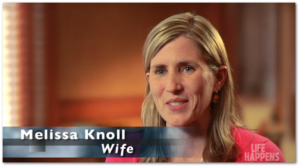 Here’s the story of Greg and Melissa Knoll, as told on the educational website, Life Happens. “Greg Knoll lived life to the fullest. He loved sports cars, snowmobiles, speedboats—‘anything that was loud and fast,’ says Melissa, his wife. An economics major in college, he grew bored with his desk job at a mortgage company and opted for something more exciting. He joined the Minneapolis police department and became an undercover officer. But one area of life where he took no chances was with his family. “Greg met Melissa in college, and they married shortly after graduating. While still in their mid-20s, the two talked with their insurance professional, Joe Fox, about life insurance. They were young and healthy and didn’t expect to need it soon. But they had a new home with a mortgage and were ready to start a family. Greg already had the maximum amount of coverage he could get from his employer, but knew he needed more and bought it through Joe. “When Greg was 36, he began experiencing chronic heartburn that wouldn’t go away. After gall bladder surgery failed to cure it, doctors discovered a rare form of stomach cancer. When Greg passed away two years later, Melissa found herself unprepared for the aftermath. His death was ‘never part of the plan.’ Fortunately, Joe was with her every step of the way, guiding her through the many personal and financial decisions that followed. Go to LifeHappens.org to watch other true stories of how life insurance plays a vital role for families young and old. What do Walt Disney, J.C. Penney, and John McCain have in common? Of course, they all had—or have—life insurance. But wait! There’s more! These three (and others you can read about) found uses for their life insurance policies that go far beyond what everybody thinks life insurance is all about. We might not have Disneyland without Walt’s life insurance policy. Old J.C. used his life insurance policy to keep the doors to Penney’s open after the Great Depression. The Pampered Chef and Foster Farms Chicken are just two of the companies that came into being thanks to life insurance—and nobody had to die for any of that to happen. Read about famous people who used their Bank On Yourself-style life insurance policies to accomplish great good in some very unconventional ways. Learn more about the different kinds of life insurance available to you, as well as the difference between death benefits and living benefits. Then get in touch with Bank On Yourself for a free analysis and a personalized report showing what the right kinds of life insurance policy could do for you and your family. *Thanks to LifeHealthpro.com for their contribution to this brief history of life insurance.